The gallery has the usual main menu list-with-thumbnail structure. The Albums app automatically locates images and videos, no matter where they are stored. Images and videos stored in different folders appear in different sub-galleries that automatically get the name of the folder – which is quite effective file management. Unfortunately, the gallery undertakes re-indexing of the content each time you access it and it does so even when you open a file for an instant and then get back to the thumbnail view. And that's a bugger as when cards are full of content, it's quite slow to complete. Right next to the folder's name is a figure indicating the number of images stored. Each sub-album has a thumbnail of the latest image. The contextual menu of the main Album view has only one shortcut to the settings menu. At the bottom of the main album there are three tabs – one for the actual folder list, another for Facebook and, finally, Flickr. The latter two display images from either account or those posted by your friends. Anywhere in the gallery except the main Album view you can launch the camera or camcorder to capture new images, share them on Facebook, Flickr, Gmail, HTC Mail, Messages, Peep and Picasa, and delete the current image. In the HTC Gratia image folders you can choose between grid and filmstrip layout. You are also able to mass delete images, but still no mass copy and paste options. While you cannot copy/paste images from folder to folder (you'd need a proper file manager for that), you can still share multiple images from your albums on Facebook, Flickr, Gmail, HTC Mail, Messages, Peep and Picasa. HTC Gratia supports multi-touch and you can take full advantage of this while browsing your images. Zooming in and out is done in the same fashion as on the Apple iPhone. You can zoom to 100% with simple double tap on the screen. The implementation here is very smooth too. Video files can be accessed only from the Albums subfolder as there is no separate icon for the video player in the main menu. The video files can also be viewed as a grid or filmstrip and can be shared over Gmail, HTC mail, Messages or YouTube. The video player application on the HTC Gratia is quite basic. There’s a full screen mode, where the clip gets stretched / cropped to fit the screen. Quite as expected, the player is capable of playing only 3GP and MP4 videos, which means that you will have to convert most your videos for watching on the go HTC Gratia. The Aria handled all of the MP4 files we threw at it with ease: no dropped frames or out-of-sync audio. Videos with VGA resolution played well, we even managed to get a 800x480 video playing (though its bitrate wasn’t very high). The music player dates all the way back to the HTC Legend. The standard music library view is the Artists section, but you can easily switch to one of the other six tabs beneath, which are for Albums, All Songs, Playlists, Genres, Composers and Purchased. The Now playing user interface, though very sleek and more comfortable doesn't offer new features. Swiping between songs in the now playing screen has a cool 3D effect. We were disappointed to find no contextual search in the music player for songs and related stuff on YouTube or Google. The other music player weaknesses of the Android platform still need addressing too – no equalizer presets, nor any alternative skins. The HTC Gratia is also equipped with an FM radio, which has a pretty simple interface. It automatically scans the area for the available stations and allows you to mark some of them as favorite for easier scrolling between them. It also supports RDS and allows loudspeaker playback. It’s a little slow to start though – it takes 5-6 seconds. We are pleased to note that the HTC Gratia did very well in our audio quality test. It achieved some excellent scores when you use it as an audio source for external amplifiers (such as a car or home stereo), rivaling some of the best handsets we have seen. And things aren't much worse when you plug in a pair of headphones. 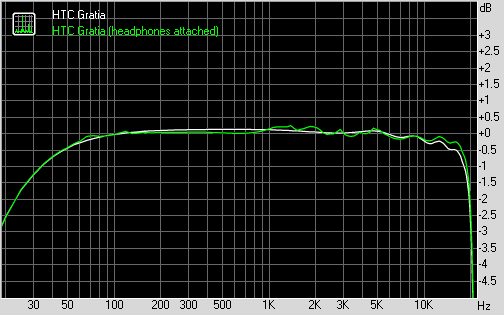 As usual the stereo crosstalk and the intermodulation distortion increase, but still remain respectable. The dynamic range is also slightly affected but the deviations are still mostly detectable in lab conditions. And we give the Gratia an extra point, because it's pretty loud too.